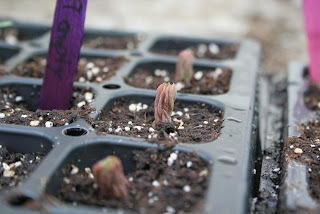 Well the first day of spring has come and passed and managed to keep me quite busy outside as the weather was reasonably nice (although I would have liked to see some of the warmer weather we had earlier in the week). 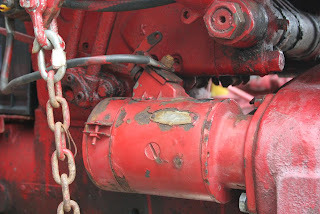 Started out the day replacing the starter on the Farmall A with the mower deck as it had quit working mid winter. Luckily I have a couple parts tractors for these things so I managed to change it over. It was not quite a straight swap as grandpa had converted this tractor to a key start and the starter came off an original pull start (where you pull a wire attached directly to the starter) so I had to switch the wires around a bit, but overall it went quite well. 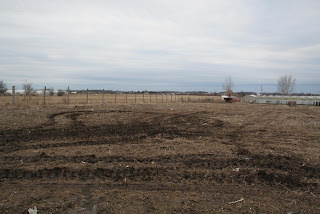 After I had the tractor running and moved it out of the muddy field (the mud made most of the days work interesting) and onto the driveway I worked on finally installing hinges and a couple latches on the gate in the sheep pen. Up until now it had been tied in place with rope and every time you wanted to get in the pen with a tractor, or didn't want to jump over the sides you had to untie the gate, which always took a while as I had it tied really well. Now the gate is easy to open and with a latch on the top and bottom they will have a hard time pushing it open. Next loaded up the trailer with a bunch of scrap steel from the pasture out back that had been there for a while. I decided I needed to start cleaning things up as we are getting closer to closer to the day when I can let the sheep out of their winter pen and onto the larger pasture. My main goal for the day had been to finish, or at least get close to finishing the perimeter fence, but alas, I never even worked on it once. Oh well. 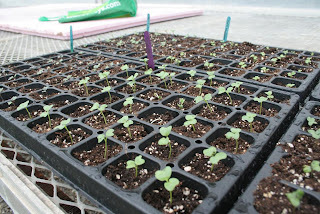 When I dropped the scrap off I also picked up a smaller germination table that Randy had built. 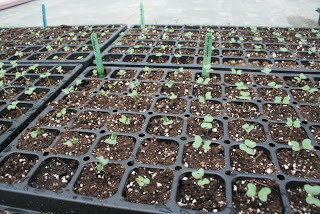 Him and I loaded it up into the van and brought it over to our greenhouse. 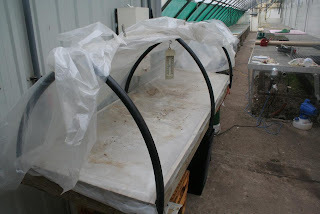 That thing was crazy heavy with all the sand in it, but we managed to sneak it out of the van and into the greenhouse. 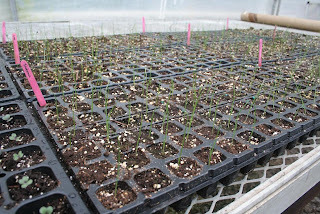 This should give us just enough room for all of the seedlings we need to start when things get busy and our tray capacity is now at 51 trays. Next came the hard part, cleaning some of the manure out of the sheep pen. This job needs to be done about 3 times over the winter in our pen as the pack tends to build up from some of the hay the sheep waste next to the feeder. As the manure pack gets thicker it starts getting closer to the feed trough and they start wasting more as they don't like to eat anything that falls onto it. It is quite a big job as I have to load it into the trailer by hand and then out of the trailer by hand again as I don't have any equipment to make the job faster. Needless to say I actually enjoy the work and don't mind the smell either. 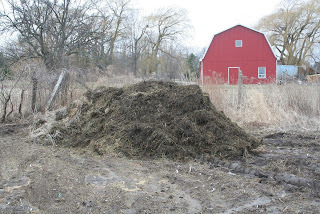 I get really excited about manure because I see the potential it has for fertilizer once it breaks down. 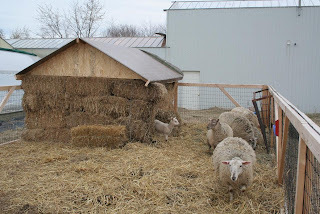 Our low-tech sheep barn is still holding strong after the winter and only requires minor maintenance on the open ends of the walls where the doorway is because the sheep rub up against it and wear them down. Maybe next year a bit of plywood will help keep it up. After cleaning out the manure I put down a fresh layer of straw to keep the floor of the pen a bit clean. Except for a few other little things that was mostly my day on Saturday. 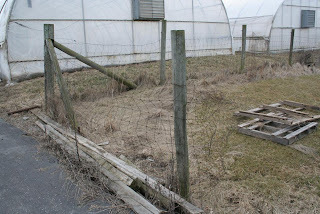 Overall I am happy with what I got done, although I am a bit disappointed the fence was never repaired. Maybe next week! 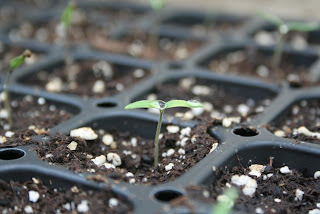 Something Randy told me to stick in the soil that we found on his germination table. I already forgot the name of it (and now Randy is reading this shaking his head). Good for you getting so much work done.